Close to the Bhagavati Temple -see post below- stands the Princess of Wales dispensary, a modest but elegant building. 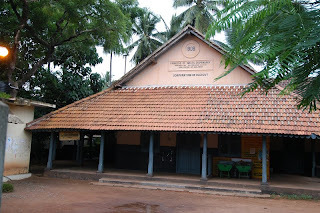 It was opened by Mr.W.Francis, Collector of Malabar in 1908 - the same Francis after whom the road leading from Kallai Road to the Calicut Beach is named. It is probably the oldest functioning dispensary building in these parts. At a time when the government was not obliged to undertake welfare activities, the enlightened collectors of Malabar had taken initiatives to help the poor in many ways. We find further proof of their philanthropy to the west of the dispensary where a resting place for porters was built by another Collector, Mr.Innes. Named after his wife, the structure stands as a monument to the Benthamite rulers of Malabar. A structure now used as a bus waiting shed stands next to this, appropriately named 'Innes Rest House'. is it still a dispensary? i will go & see it next time i am there.. Yes. A portion is functioning as a dispensary and the rest is occupied by the health inspector. There is a threat of demolition to the building from 'development-minded' civic body but hopefully it may not take place!